And then it was off to Vietnam via high-speed ferry to Kumamoto City, bullet train to Fukuoka, and airplane via Taipei to Ho Chi Minh City (which most folks, even the Vietnamese, still routinely call Saigon; indeed, the airport code for Tan Son Nhut is SGN). The ride from the airport to our hotel in the heart of the business district can only be described as “Motorscooter Madness.” Though cars are no longer rare, including the 8-passenger van we were in, the overwhelming majority of Vietnamese travel by motorscooter. 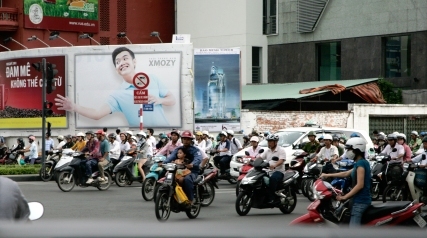 And while this is true throughout Vietnam, nowhere is it more evident—and harrowing—than in Saigon. 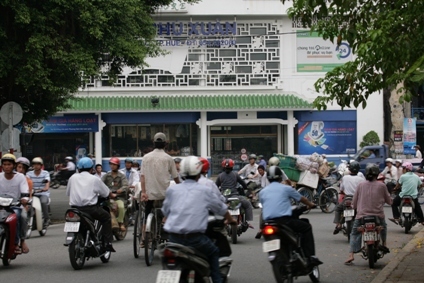 The roads and streets and avenues and alleys are clogged with motorscooters. Thousands of them. Tens of thousands of them. Defying death. Defying logic. Defying imagination. Many of the major intersections and roundabouts are without traffic signals, and traffic cops are equally rare. Traffic signs and street markings seem to be considered suggestions only, scooters blithely driving down the wrong side of a street, on the wrong side of a median strip, or up on the sidewalks, weaving in and out and around each other and the cars and trucks and bicycles, using no signals, avoiding collisions by heart-stopping fractions of an inch, flowing like water or mercury or lemmings, all without apparent concern, let alone anything even remotely resembling Road Rage. And aboard the motorscooters are young women in business attire or, less often, traditional Vietnamese dresses called ao dais, or simple blouses and trousers (we used to call them pajamas, but they’re not), men in business suits or blue jeans, flip-flops, and Jimi Hendrix t-shirts, two to a bike, three to a bike, sometimes whole families, dad driving while holding an infant, mom behind with a small child standing between the parents. Or maybe a crate of chickens strapped to the seat behind the driver. Or behind the driver and a passenger. Or a couple of pigs. 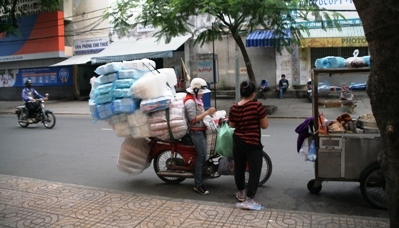 One man had a refrigerator, lying horizontal, balanced on the back of his scooter. Others had baskets of produce stacked on either side like fat saddlebags piled so high you couldn’t see the driver. Or cases of beer. Or bags of cement mix. 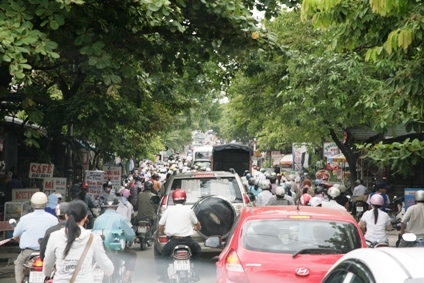 We arrived during rush hour, but motorscooters fill the streets late into the evening. Cruising on one’s motorscooter is apparently a major social activity. After checking into our hotel, I wanted to show Anne the nearby Saigon River. But when we got to the boulevard that runs along the waterfront, the scooter traffic was so constant, so dense, so relentless, that we were afraid to attempt to cross. I couldn’t get beyond the potential irony of surviving 13 months in combat only to be run down and killed by a 20-something Vietnamese yuppie on a Kawasaki Slingshot. We walked around the block instead, passing the Majestic Hotel Graham Greene wrote about in The Quiet American. When I had stayed there in 1985, the elevators sometimes worked, the air conditioning didn’t, and the restaurant’s menu offered fewer choices than a Soviet-style election ballot. Now it’s a five-star hotel and casino.